In an Episode of Ham Nation or Amateur Logic featuring Joe Eisenberg (K0NEB), I saw him recommend a few radios as good beginner projects. The 2P3 radio looked like an entertaining project and something I could probably tackle with one of the kids. Amelia had recently discovered an old “boombox” from my youth and was playing the radio a lot. We decided it might be fun to listen to a radio that she had built. I ordered the kit from Amazon. The instructions come on a beautiful HUGE poster. It has an enormous schematic of the radio. I had wanted to build the radio by stage and is recommended when home brewing a radio. We started from the power conditioning part of the circuit. Once we had all the parts of the power we went back and installed the audio amplifier and worked our way backward. I had intended to test the build frequently as we went along. Initially I couldn’t get any of the measurements to come out according to the schematic. I would go back and study the schematic and I was absolutely certain we had put the parts in the right polarity, etc. and continued forward. On the final day of the build I finally figured out why. . . The way the circuit is designed there are purposefully installed breaks in the circuit. There is an X to mark the spot in the 3 points. basically they don’t allow power from the power rail to the circuit block you just finished. Being confident I had quintuple checked everything I bridged the circuit breaks and turned on the power the tested all the levels on the schematic. It worked! first try!! The 2P3 is definitely NOT a beginner kit. But it is a great kit to build with someone who knows just a little and the finished product is a really nice radio. As I mentioned in a previous post, Berkley decided she wanted to learn CW. After having learned a few letters, I was pretty confident it was going to stick, but we needed to have a way for her to practice. I have used the Ham Gadgets Ultra Pico Keyer for a few years on my HomeBrew 630M transmitter. Disconnecting and reconnecting is super annoying, so I opted to get her one of her very own. I’ve recently had a break through with the kids. As a dad, one of the great struggles in life is how to help your kids develop their God-given talents. This must be balanced with not losing yourself at the expense of your children believing the world revolves around them. OK. . . this isn’t a parenting blog. It is possible that we won’t agree on this, but. . . I think we all want to share what we are passionate about with our kids. I enjoy the outdoors, hiking/camping, and amateur radio. My daughters are forever telling me radio, is for boys. OR, operating digitally! In this first episode of a series on operating digitally, we’ll begin by hooking up a SignaLink to an Elecraft KX3…. For sometime I have had a MFJ-259B that I had purchased from an SK estate. I have treasured the device for a number of reasons. I knew what I had paid for the device was helping that ham’s family and I felt like I needed to honor his memory by using the analyzer. Use it I did! KB5NJD even helped me mod it so it would give us readings down to 470 kHz and I could tune my 630M antenna. 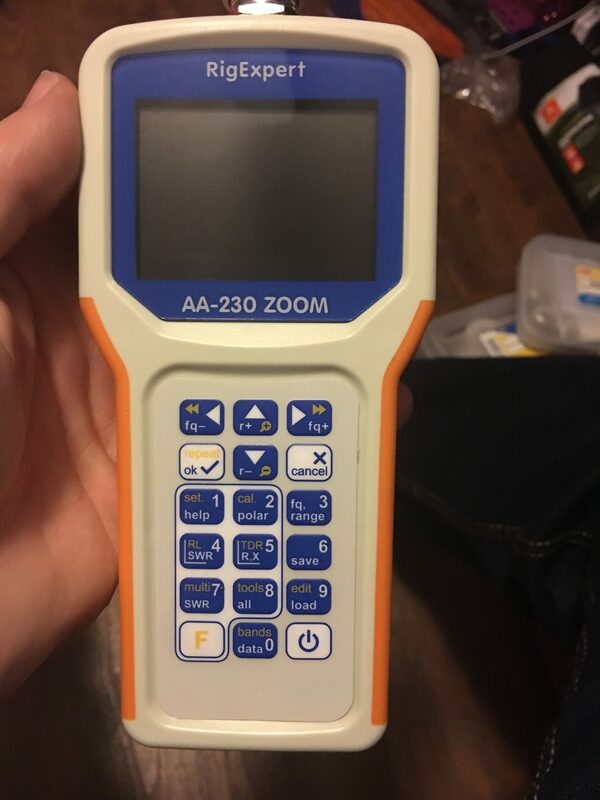 As my knowledge has improved, I came to find that there are a lot of things this model of antenna analyzer does not do and that made me think about getting a different device. One: It doesn’t resolve the sign of X. i.e. is my load inductive or capacitive? W2AEW has a great video on how you can actually resolve the sign of X using a smith chart using an MFJ 259B style analyzer. Two: The oscillator in the machine is not particularly stable in my opinion. i.e. what freq I was measuring was in doubt by up to 20hz. This isn’t a deal killer for measuring impedance in the field, but is frustrating in a lab environment. Three: The freq. knob is too sensitive in my opinion. I suppose it makes sense given the tuning range within each band the analyzer covers, but I wanted a little more precision. Again — As a new amateur, it is perfectly adequate as an antenna analyzer. But I wanted something a bit more capable. As it turns out a friend has an AA-600. He was showing me his conventional transformers and how he could measure the frequency response with the AA-600. Not only will it define the sign of X, this thing draws a Smith Chart. It will auto sweep over the entire spectrum of the oscillator enabled on your machine. You can do live measurements where it will show you the rectangular format of impedance and the vector form of impedance. This is a genuine scientific instrument. If I decide I really want to experiment at 440 MHz I can always up grade later. For a long time I have wondered WHY do people always scream a warning at you if you plan on using a small magnetic loop. “Be careful, there is a lot of voltage across the capacitor!” yeah, yeah. . . OK, whatever. . . I’ll be careful. I asked a number of friends. I heard a lot of explanations. The one that stood out to me was that a mag loop acts like a auto transformer. uhh. . . I’m sure someone reading this is going, “yeah!” You could have told me that it has to do with a wind storm on Mars and particle entanglement. This seemed just as plausible to me.